Soak that in for a minute. When my friend JUST posted this moments ago on her facebook page; I thought, “PERFECT”! God’s so cool with His impeccable timing. If we listen for that still, small voice… It’s there. We just have to slow down, look, and listen. Thank you friend for posting this! 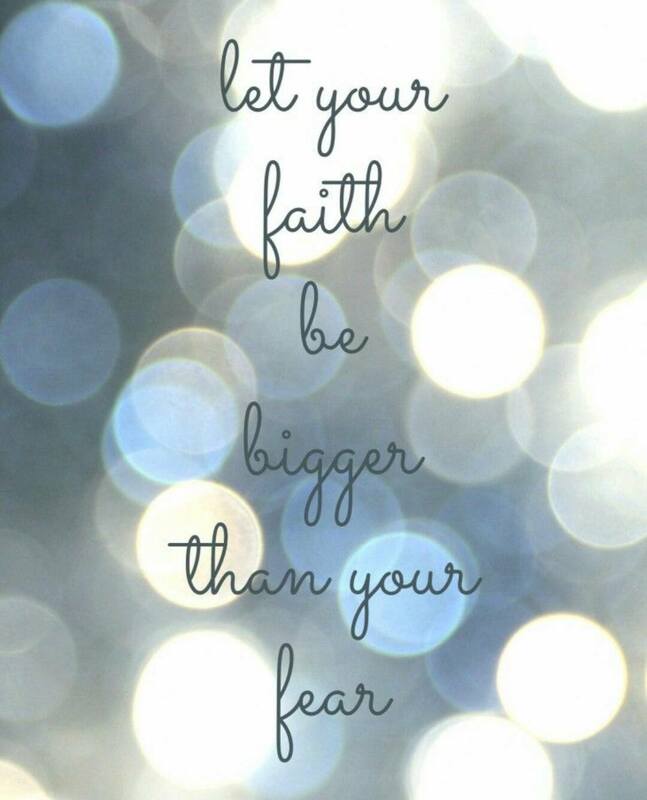 In order to allow our faith to be BIGGER, we have to figure out what our fear is. What’s yours? Sure, we all have the general same fears. Put a random spider near me and I’ll throw down more advanced martial arts moves than Bruce Lee, Jackie Chan, and Chuck Norris could ever achieve in their lifetime of martial arts studies! Nah, I’m not talking about that kind of fear. I’m talking about the REALLY scary stuff. That last one. “Am I doing the right things as a parent?” Ouch. This one is a biggie for me. Again, I’ll refer back to previous blog posts for a bit more information why it’s a biggie. Of course I hope to do the right things. The best things. But I think there’s a better way to phrase that question to where it’s not even a question at all. Let’s try this on for size. Much better. Lengthier, but better. God wants us to call out to Him. He’s here through the awesome and not-so-awesome times. He’s cool like that. I’m talkin’ red spaghetti sauce in the hair, up the nose, on the wall, on the white dog’s head because she has zero depth perception when the kid drops food kind of messy. How’s that for some imagery, y’all? Consistency is very important in parenting in more ways than one. Kids crave it. They aren’t going to say, “please mom, serve me some more consistency please”, but they need it. Consistency is more than establishing routines. It establishes safety, security, healthy attachment. Then it should be easy, right? Our kids’ hearts get sad. We get sad. It’s easy to give in. Appease the situation momentarily. It really goes back to the whole “give a man a fish…” proverb. Teaching. Scaffolding. They go hand in hand. Model the behavior you wish to see. Your children will build themselves up and learn to self-regulate their own emotions and behaviors. It’s very cool to see. Not always easy to do. Okay, so why all the parenting talk? This past week has been rough in some ways. Not all, but some. Again, there’s that optimist comin’ out! We have had super frigid temps and snow, so we have had several days together at home all together. NOT complaining. I love being at home with my family and would do it full-time if able to do so financially. Of course, this brings about a few stressors. Cabin fever. Issues with returning to daycare after lots of family time. Plus, when there are other stressful situations, we sometimes have associated feelings that cloud our thoughts and slam that faith door shut. Those who REALLY know me know that I’ve often had to be a parent to my own biological mom, both as a child and much more frequently as of recent. I spoke to my former guardian who received a message from my mom (mom doesn’t have my phone number). Mom needed assistance as she has needed before. Without giving every detail… it was one of those give a fish or teach to fish situations. Unfortunately, she hasn’t been able to be taught this particular life skill and it has been very seriously detrimental to her well-being. She’s only 49 and is not in the best mental or physical health. I advised my former guardian to call DHR (Department of Human Resources), which is like DSS (Department of Social Services) in Virginia for those in Alabama. I told her that I would make a follow-up call. I work in mental health. I know that it is historically more how do I say… tedious for DHR/DSS to get involved with adults than it would be for children. So many guidelines, criteria, etc. for agency involvement. So, my former guardian called. I was given the name and number of the APS worker assigned to mom. I called immediately and left a message. After a bit of phone tag on Thursday, we finally connected and discussed mom’s situation in depth. Again, I can explain more in person but out of respect, will not post all details online. I explained my fears for her well-being in regard to falls, health issues, lack of self-advocacy skills, and poor decision-making ability. That was enough to have a case opened. I’ve had to make these calls for my clients. It’s not an enjoyable phone call, but is necessary when someone’s well-being is in question. I get that. But having to call about your own parent? Yep, like that pain that happens when you rip a band-aid off. It’s just one of those things in nature that shouldn’t have to happen, ever. I’m pretty sure I lost a contact while doing so, because when I tried to take them out later that night… I discovered one was just not there. I did get a really awesome red eye effect though because I kept trying to get the non-existent contact out. But… I HAD to have faith. I HAD to have my amazing, awesome God hold my hand through calling the DHR caseworker and talking with her. I was blessed to have family (husband/former guardian) support. But what I NEEDED was to have FAITH. That amazing, reassuring feeling that can only come from God to let me know that HE’S GOT THIS! Mom’s phones are out of minutes, so I couldn’t even let her know. My heart aches because I know my mom values her independence like whoa. It’s not likely that it’ll get fully taken away, but I don’t know how the whole investigation will turn out. I have to have FAITH. I also had a VERY stressful work email that I quite frankly couldn’t deal with at the time since I had just called protective services on my own mother. Keelyn, our 5 year old daughter, had a rough day back to daycare. Again, she had been home since Friday evening. She likes being at home. She enjoys school too though. Anyway, she had been pretty upset all morning long. I’m so thankful that she has loving, caring teachers to be patient with her and who are so concerned and just flat out awesome. I know it had to do with being at home, but that doesn’t make it easier. I talked to her midday on the phone and encouraged her to find something positive about school and let her know that it’s hard for mommy and daddy to go back to work after being at home for extra days too. We discussed what she could do when upset, etc. So, I get home and wait for the rest of the crew to get here. Keelyn immediately asks to play with my phone. I’m cool with electronics and all, but in moderation. We’ve not really moderated it a ton BEFORE… So this was a big upset in her sweet little heart. I offered options, nope. Even said “no”. Nope. She was upset, but again… moderation is so important. As mentioned way above, so is consistency. No giving in at this particular moment. She also knows we have a sort of “3 strike rule”. 3 strikes for non-awesome behavior and no TV. Well, that happened. She was trying to grab at her TV and it became an issue of safety. It’s a small TV, but could still hurt a foot if dropped on anyone, so I took it and put it in the van. 2 1/2 hours of crying, yelling, screaming. No. Shrieking. My husband tried calming her. Nope. It was VERY crystal clear that we were in this storm for the long haul. I cried right along with her a lot of the time. I kept my voice calm, because really… when does yelling REALLY help? I mean like really, REALLY help in these kinds of situations? We finally ended the night by me holding my phone and allowing her to watch 3 videos right before bed. Needless to say, she was tired. This was a moment where I felt in constant prayer. I NEEDED my awesome God to be beside me because my girl was very sad and I wanted to APPROPRIATELY make it right. It was a very tough evening. Allowing Keelyn to express how she felt (safely), while knowing mommy and daddy were both there for her was the best thing that we could have done. No judgment on her. Just freely allowing her to safely express her feelings. She needed.it. The cuddles and talk at the end of the night were all worth it. I could have been more antagonistic and could have yelled (I’ve been guilty of this and HATE IT! ), could have more easily given in to letting her have my phone, iPad, or her TV. Where would that put my faith? It makes my daily walk all about ME instead of me learning to trust HIM. That makes my faith self-centered instead of Christ-centered. The result of the situation would be more about what I accomplished and what I could control instead of surrendering and submitting to Him. My daughter would have seen anger instead of acceptance. Hatred instead of love. Pretty much the opposite of what God is and what God does. Thanking Him for those tough lessons can be humbling and it probably should be. Was Jesus’ life here on earth easy? Nope. Faith can be messy. Much like parenting. The cool thing? God is always there to help us wipe up the messes of life. Huh… He’s like the Quilted, Quicker, Picker-Upper. Cool! We just have to trust Him to be able to help us and know that it takes crazy faith to know that He can handle the biggest of messes, the scariest of fears. Another cool thing? He wants us to learn and grow. He’s there when we have our tantrums and is that calm, loving parent. I leave you with this song. “Always” by Seventh Day Slumber. It’s beautiful. Though it’s more geared toward a father/son relationship… it is EASILY relevant for a mother/son, mother/daughter, caregiver/child relationship.